A photograph may be worth a thousand words, but they have other attributes, too. They last longer and can define a person in ways that their own words may not. The photo of John John playing beneath JFK's desk helped to create the youthful and fresh image that has kept the mystique and spirit of Kennedy's three years in the White House alive for nearly a half century. 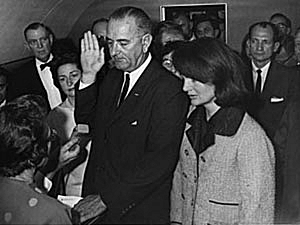 And the somber picture of LBJ being sworn in on Air Force One, with Kennedy's body in the cargo hold and a shaken Jackie Kennedy at his side, said more about sadness and the weight of the moment than anything Johnson could have said. Given the power of such images in shaping perception, it's worth the time of anyone with an interest in the presidency and how it is captured in photography to spend a little time at Zoom, The New York TImes blog of documentary filmmaker Errol Morris. Morris asked the photo editors of the three wire services that between them cover nearly every waking moment of a president, to select and discuss images that revealed important aspects of President George Bush and his eight-year term. Some easily anticipated moments are there, including some clear highs (Bush standing in the rubble of the World Trade Center talking to rescue workers) and lows (speaking below the "Mission Accomplished" banner). But so, too, are images we may have never seen: Bush holding an umbrella over his head despite it being turned inside out or riding in a 1956 Volga with Russian President Vladimir Putin. It all provides a more nuanced, less easily caricatured look at a man most of us spent eight years living with.